Finding an all natural soap to remove dead skin cells and keep skin clear while at the same time boost the skin with antioxidant benefits and skin soothing properties is what I am always looking for in a gentle effective soap for face. This handmade pure coconut oil soap with tea tree and organic spirulina by Splendor Santa Barbara has exceeded the above expectations, and in this review I will explain why. It contains some natural ingredients that are great for keeping the skin clean and preventing acne breakouts and other blemishes. The fact that it contains coconut oil, which is a great moisturizer helping restore dry or flaky skin, makes this anti-fungal and anti-septic natural soap great for acne dry skin. Coconut oil contains vitamin E which is a strong antioxidant. It strengthens skin cells and protects them from damage, preventing aging and keeping the skin healthy. This vitamin is also well known for soothing eczema, psoriasis and sunburn. Another thing I love about this natural handmade soap, which also makes it excellent for acne prone skin is the fact it contains tea tree oil, an ingredient that is popular for its anti-microbial and anti-fungal properties. Tea tree oil has multiple uses in skin care which include treating acne, helping with psoriasis and eczema, relieving razor burn, getting rid of athlete´s foot, fading scars and more. Organic spirulina is another ingredient that makes this soap worthwhile using. Spirulina is an algae which is packed with nutrients and valuable antioxidants. 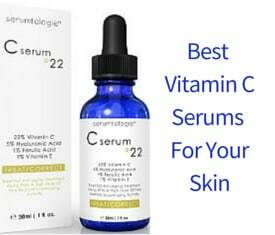 As a source of antioxidants, it is able to fight free radicals that cause premature skin aging. Overall, I like that this is a handmade soap that does not contain any useless fillers, just few great quality and effective natural ingredients. It can be used daily for face and body. Has strong anti-fungal, anti-viral and anti-microbial properties. 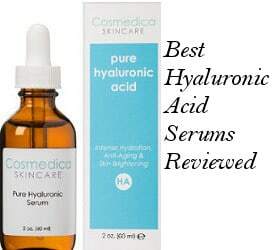 Suitable for acne dry skin, body acne, dandruff, skin rashes and more. Created in small batches with coconut oil that is food grade and Australian tea tree oil that is therapeutic grade. 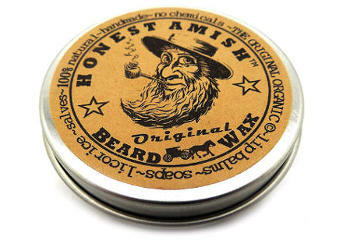 Creates a creamy lather that rinses thoroughly. Vegan soap free of palm oil, artificial colors, parabens, alcohol, sulfates, GMO´s and phthalates. Also, it does not contain gluten or soy. Has a light tee tree smell. 2 sizes available. The second size contains 3 bars of soap. Comes in an attractive box that is recyclable and great for a gift. What do Users´ Reviews say about Pure Coconut Oil Soap? Users´ reviews about this natural tea tree soap are very positive in their majority, and the not so positive reviews have to do mainly with the fact that for some people with sensitive skin, the soap has been too strong on their skin. Also, not everybody has experienced positive results against their acne condition, but of course acne is a complex skin issue to rid of just by using a bar of soap. Now to the positives! A lot of people have experienced good results for their adult acne and have said that it is good for keeping blemishes under control. Of course, you need to give the soap a little period to work before you make any final conclusions as to its efficacy. Users mention that the soap may create a tingly feeling but not a burning sensation like other tea tree soaps. It is concentrated as well as long lasting, and it does not dry out the skin. People also like that it lathers great, it rinses clean and feels fresh and refreshing as well. In addition, some of them have mentioned that it works well for dry skin. Finally, most of the reviewers have said that they are surely going to reorder. 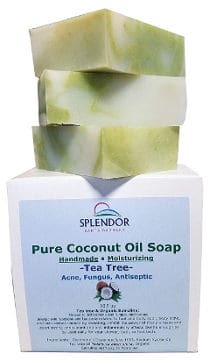 This handmade pure coconut oil soap with tea tree and organic spirulina by Splendor Santa Barbara is a top quality natural and organic soap that is free of fillers and synthetic ingredients. In addition, it is a great anti-bacterial soap which does not trigger dryness or other negative skin reactions but it may be too strong for people with sensitive skin.